COMMIT. In the software language that I work in every day COMMIT is a command we rarely use. When you use COMMIT, you say farewell to the option of turning back. Whether the transaction you created is good, bad, or ugly, it’s about to be written in stone and carried throughout the database in such a manner that it is difficult - if not impossible - to undo. So, in fear that something could go wrong, we usually opt to not “COMMIT” and wait to see if the transaction will complete by ending the code successfully. Christians can be divided into two groups. There are those that are committed, written in stone, not turning back, ready to walk forward even if it means walking through fire, pain and suffering. You don’t have to ask if they are a Christian, you can just watch the way they live with self-control, joy that is anchored deep in even tough storms. They breathe prayer on every worry, and faith overcomes every circumstance. Then there are those that are uncommitted. Pending anything else occurs that would cause them even slight inconvenience in following Christ, they’re willing to go until the end and live successfully. They attend church when it’s not raining. But they don’t study to show themselves approved (2 Timothy 2:15). They put on their church face, shake their church hand, sing their church song, and walk away unchanged, yet feeling as if they’ve done God a favor. Let a little storm blow into their lives and suddenly their somewhat committed lives are turned around and they run away from the goal instead of toward it. 1 Peter 4 ends with Peter warning of a time that is coming when God will judge all people. He tells us that the judgment will “begin at the house of God”, with God’s people. Afterwards He will judge those that do not obey the gospel of God, the unbelievers. There is a purpose in God’s priority list for judgment, and it has to do with the level of responsibility we are given. Luke 12:48 also says “But he who did not know, yet committed things deserving of stripes, shall be beaten with few. For everyone to whom much is given, from him much will be required; and to whom much has been committed, of him they will ask the more.” Knowing God is power and power must be used wisely. Knowing God’s will for your life creates a responsibility to follow it. Ah! Many now say, “Then why learn God’s way at all? Ignorance is bliss!” Pardon me while I pop your bubble with another verse, Romans 1:20, which says, “For since the creation of the world His invisible attributes are clearly seen, being understood by the things that are made, even His eternal power and Godhead, so that they are without excuse”. Without saying a word, without communicating anything but the power of His creation, God has made Himself known to all of us. The fool has said in his heart there is no God (Psalms 14:1), but God has clearly been revealed in everything around us that He gave life. There is no excuse. There is no way out of the race, whether you seek the goal or not. Judgment will come to all, believers and unbelievers. But believers will be the first to give an account for their sins. These are sins committed, and good deeds left undone. But there is one sin that will only be committed by Christians. Ezekiel 3:18 says “When I say to the wicked, ‘You shall surely die,’ and you give him no warning, nor speak to warn the wicked from his wicked way, to save his life, that same wicked man shall die in his iniquity; but his blood I will require at your hand.” Make no mistake. If you live with the incorruptible seed of salvation in your soul, and walk without Christ in your life, uncommitted, you run the risk of sending others to hell. If they look at you and say “She says she’s a Christian, but she’s no better than I am! We’re no different! What good is Christ?” check your hands. They may be dripping with blood. Your life should lead others to Christ. No one else can live the life you have with the connections you have. It’s your job - your responsibility - to you’ve been given to show them the light of salvation. 1 Peter 4:18 says “Now if the righteous one is scarcely saved, where will the ungodly and the sinner appear?” Translated into its original meaning, what Peter is saying refers to the light we are to shine on Christ, leading others to Him. Peter says that if the righteous is uncommitted and not shining the light of Christ to those around Him, how can the sinner that’s watching see Christ? He stays in the darkness. Commit. Write it in stone. Throw out plan B. No turning back. Good, bad, or ugly, more forward toward the goal! Live for Christ with your bright lights on, blinding Satan when he comes near! Live so that those who watch your walk with Christ will desire to know Him, and experience the joy of salvation. Commit your life to Him who is faithful to you, who saved you to the utmost. 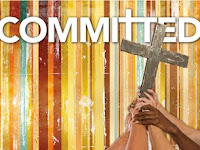 Commit to Christ, who died for you, but never stopped serving, as He is serving you at this very moment at the right hand of God as you intercessor (Hebrews 7:25). Let there be no blood on your hands. Let there be no regrets in Heaven.